Sew N Ink: Yay its Here!!! Yes the new Stampin Up Mini Autumn/Winter has gone live (as of April 1st - July 31st) which means new launches are all happening and I have just had an exciting weekend of events with my own launches which have been a resounding success as before as new and loyal customers continue to be part of my SU and creative journey. Click on the new Mini catty image to have a browse and if you wish to order shoot me through an email- I will be at your service directly! Ok so rather than give you photo overload, I shall try and pace myself and give you a little bit more regularly to show my launch memories. My Example display that the guests got to see while doing their workshop. I was inspired with the gift-bag idea from a fellow SU demo Julie Leece, she used the Bird design on her bag. 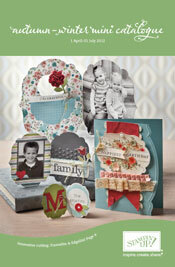 Love these new Framelits Dies and the Apothecary Art stamp set! I had two events- Friday night and Saturday avo here are the two cards that we done for the make n takes, pink version Friday night and the blue version Saturday. Well I better leave this post as is with more to follow. I love your projects and thank you for sharing them with me. As always your colour combinations are beautiful. I think I need another visit to Toowoomba to sit in your lovely craft room to gain some inspiration. I thank God you are in my life.